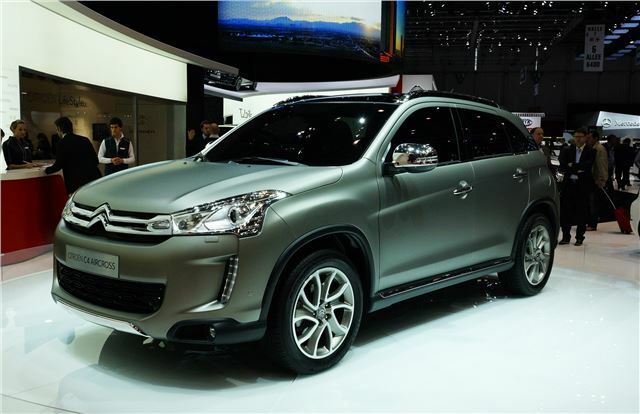 Citroen officially unveiled its C4 Aircross at the 2012 Geneva Motor Show. The Aircross is basically Citroen's equivalent of the Mitsubishi ASX and there will also be a Peugeot version - the 4008. It goes on sale later in 2012. Both two and four-wheel drive versions will be available and four-wheel drive versions will have three settings, including LOCK for tough conditions and a 2WD mode to improve fuel consumption. Three engines will be available – a 1.6-litre 115PS petrol, a 1.6-litre 115PS diesel and a 1.8-litre 150PS diesel, the former will only be fitted to 2WD models. The HDi 115PS emits just 119g/km of CO2. Equipment includes a touch screen sat-nav system, a reversing camera and USB/Bluetooth connectivity, as well as LED running lights and an optional panoramic glass roof. The show car at Geneva is finished in a Vaopr Grey colour with a frosted-texture paint. The roof bars, mirrors and door handles are all finished in chrome plus there are two-tone diamond effect alloy wheels. Citroen will also show the revised Berlingo Multispace which gets a new looks including a redesigned front end and can be fitted with LED daytime running lights. A new Black Pack is available which comes with Onyx Black trim on the top of the front bumper, side mirrors and side rubbing strips. Interior materials have been upgraded and the Berlingo now comes in two new colours Nocciola and Belle Ile Blue. The engine line-up includes e-HDi diesels with start/stop with CO2 emissions as low as 125g/km. Citroen will also unveil the DS4 Racing at the Geneva show.